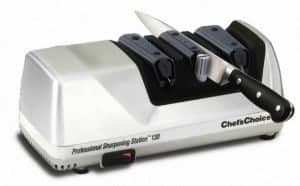 The Chef’s Choice® Professional Sharpening Station® M130, made it into our top 10 list due to is combination of affordability and superior 3 stage functionality. The unit is engineered using the same Hybrid approach as other Chef’s Choice models, (only this time the fact does not form part of its marketing efforts). Using a combination of electric and manual sharpening technology, the M130 can sharpen a variety of serrated and straight-edge blades (with double-beveled edges) including European kitchen knives and hunting, fishing and pocket knives. We have seen some reports that it is not perfect for Asian style knives however. The first and third stages of the unit are electric, with the second stage being Manual. Each of the stages contains different conical disks. These are embedded with hardwearing diamond abrasives, that create a sharp and durable, arch-shaped edge to your blades. This ensures that your knifes will last longer between sharpening as the edge is more resistant to folding over and thus becoming dull. 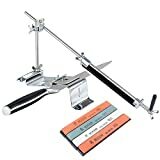 The first sharpening stage is the coarsest, and used for more aggressive sharpening. The third stage has a Chef’s Choice patented flexible stropping/polishing disk. (Edge Craft have more patents than any other knife sharpening manufacturer, an indication of their position at the forefront of sharpening technology). The third stage has a much finer grit, giving a more refined finish. The second manual stage contains a small butcher’s steel, again diamond coating is used. The unit is able to sharpen the blade instead of just realigning the edge like most sharpening steels. You need not concern yourself with alignment either. Each slot within the M130 is designed with a spring-loaded knife guide. This acts as a stabilizer, holding the knife steady and at the correct sharpening angle (20° on each side) while you sharpen. The M130 has achieved consistent positive user reviews on the internet. The unit is delicate enough on its finish that minimum metal is shaved off your blades through sharpening. Which of course means your knives will last that much longer. Although the M130 can sharpen both standard and serrated knives, some users have commented that only the tips of serrated blades are sharpened, and that sharpening does not occur all the way down to the base on knives with heavy bolsters. As we have already stated, there has also been some negative feedback on the fact the unit is not entirely suitable for Asian-style knives, such as santokus, which have a narrower bevel than Western knives. It can still sharpen these types of knives, but not as well as other sharpeners on the market. Like nearly every sharpener in the Chef’s Choice catalogue, the M130 is very easy to use. Always read the manual however, as this will tell you which grooves should be used for specific types of knife. Some user comments have criticized the manual for being confusing in places. You can read an online version here. The spring-loaded guides make the system more or less fool proof. It is also very safe to use as the sharpening discs and concealed within the unit and cannot come into contact with the users fingers. The built in honing stage is also a positive point for many. Overall the Chef’s Choice Professional 130 will sharpen your knives with a durable, long lasting edge. It is fast and easy to use, and at the $150 price range is an affordable, cost-effective way to sharpen a variety of serrated and straight-edge knives with a 20° angle. 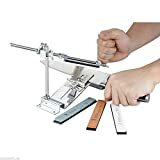 Also, you have the added bonus of the manual sharpening stage, with its spring guided slot, you can hone your knifes regularly, extended their overall lifespan. A highly recommend unit that made it into our top 10 for all of the above reasons. The Chef’s Choice® Model 130 is ideal for anyone wanting to purchase a fast, and effective foolproof electric sharpener for the home.